The measuring tool is very helpful to those learning to digitize. If you want to know what size satin stitch is good for applique – measure your favorite designs! Now you have a starting point for the values that have worked for you in the past and will probably work for you in the future! It is also a great trouble shooting tool for those that are trying to find out why a design is not stitching nicely at the machine. Yes, if you are new to machine embroidery, most problems have to do with threading the machine, not threading with the presser foot up, hooping technique, wrong needle, wrong thread, not creating a stable surface for embroidery, inserting the bobbin upside down, not threading the bobbin correctly, using the wrong stabilizer, not treating stabilizer as something that is important to a successful stitchout, using the wrong needle, using a dull needle…..ok you get what I’m trying to say 🙂 If you are new to machine embroidery and have purchased a design from a reputable digitizer, most of the time, the problem is with something you are doing at the machine. However, once you add software and new digitizers or new to you digitizers into the mix, the number of things that you need to check when trouble shooting doubles or even triples. 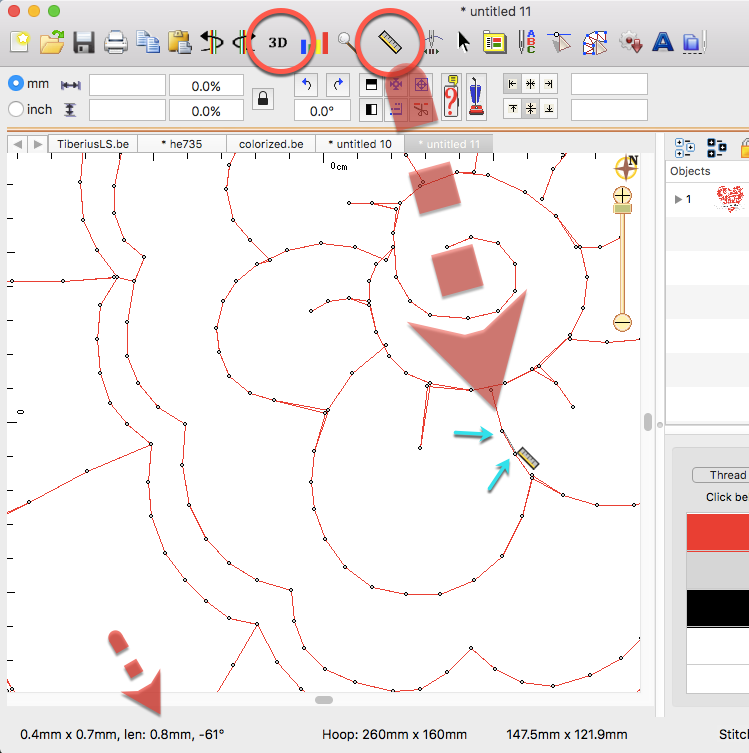 ONE of the tools that you can use to see if the problem you are having is with the design is the measuring tool You can get information about the stitch length and density on designs that stitch nicely and understand why problems occur on other designs. The key is to zoom in as close as possible, switch to metric, and turn off 3D. In the first picture I am zoomed in 1200% – that is closer that your nose touching an embroidered design. I usually NEVER get this close to a design but it was the only way that I could actually measure the stitches. Zoom is your friend for looking at stuff. Using the measuring tool I put my mouse cursor on one needle point and drag it to the next needle point – see the two cyan arrows. While still holding down the mouse button look at the lower left status bar. The length is .8mm – less than 1mm. To give you a point of reference – go grab your 75/11 machine needle – the width of that needle is .75mm and a 90/14 is .9mm so these stitches are smaller than the width of the shaft of a 90/14 needle. The second picture is of a TINY strawberry that has shading which is sort of sketch like – best I could find to show. 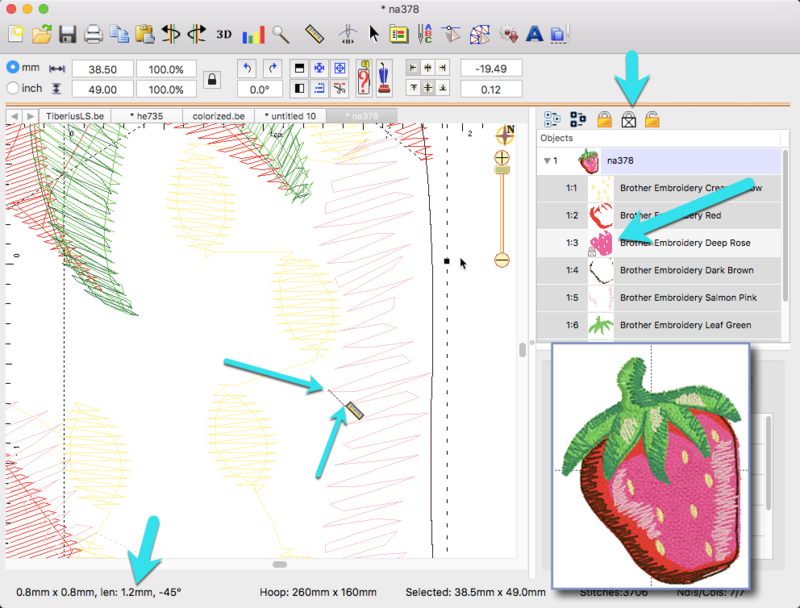 Again – zoom in, turn off 3D – if you can’t see the stitches you want to measure remember that you can hide stitches by using the Lock & hide in the object pane. This shading on this tiny 1-1/2″ strawberry is about 1.2mm apart. 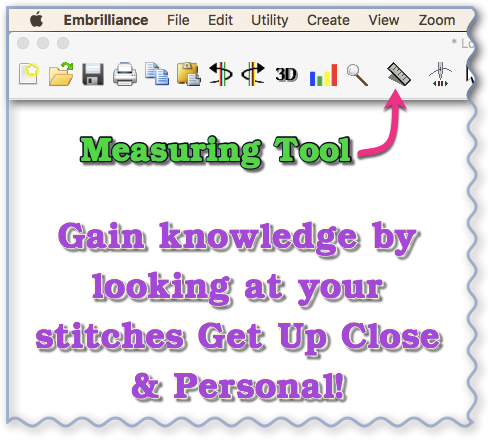 Measuring tool = AWESOME – USE IT!! Want to know “the best width for an applique? 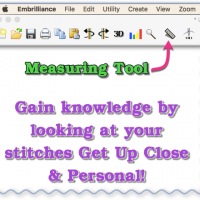 You have applique designs you like – measure them! 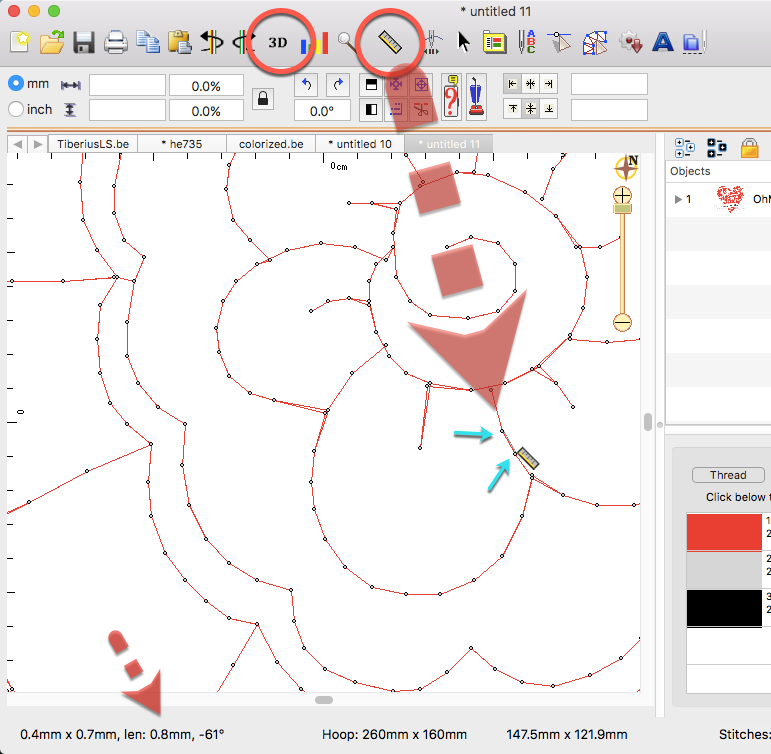 Like how a sketch design has longer sttiches in addition to the less dense fill – measure them! Look at your designs – hmmm no underlay on that shading – make notes. This is how I learned to digitize and it still works today – in fact I think its the ABSOLUTE BEST way to learn to digitize. Unless you digitize the exact same design over and over on the exact same fabric and the exact same stitch fill and outline style – your values are going to change – CONSTANTLY. That is why you have digitizing software – to be creative and bring your ideas to life on fabric. Look and learn and investigate and take notes. ENJOY! 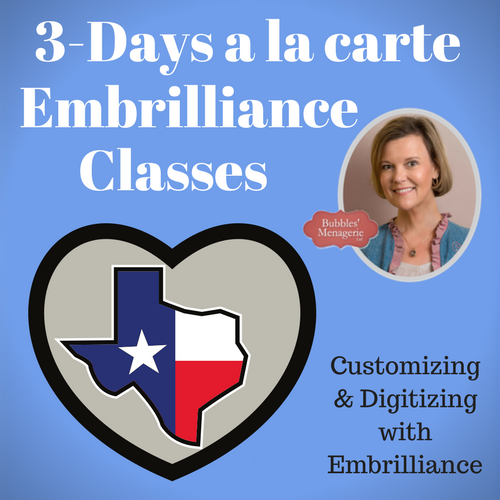 If you are looking to purchase the Embrilliance software and like the information that I post in my blog and on my youtube channel – I would greatly appreciate it if you use my affiliate link when you purchase. It doesn’t cost you anything, but I make a small commission which encourages me to create more how to videos and write information blog posts such as this! THANK YOU!